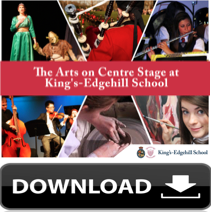 Aside from the co-curricular bands at King's-Edgehill School, there exists a number of student-run groups that get together whenever they can in their jam-packed schedules. One such group is Alkazar. Formed last year by lead guitarist, Grade 11 student Max Cole, the group includes fellow Grade 10 students, Aria MacDonald (vocals) and Grace Gallant (bass), and this year’s Head Boy, Nick Cheverie (drums). They love playing classic rock songs and, since they've been together, they have played to quite a few appreciative audiences of all ages. At the recent Terry Fox BBQ, they did a convincing job of the 90s pop hit Dreams, by the Cranberries. I think you'll enjoy seeing a different twist on the KES music scene in this clip. Click here to view their performance.